Cooking spinach is not very difficult. In fact, it's rather easy! Spinach is an annual plant, with juicy leaves and a small amount of calories. It contains a large amount of chlorophyll. It is full of minerals and vitamins including potassium, calcium, magnesium, sodium, phosphorus, and iron. It is also rich in vitamin C, beta carotene, and nearly all the B group vitamins. Spinach, especially older plants, contains large amounts of cellulose, which is essential for healthy bowel movements and excretion of waste substances from the body. However, I must warn you of a couple of things when it comes to consuming and cooking spinach. People suffering from gout, arthritis, rheumatism, or those who have problems with their gallbladders, should avoid it because of the content purines and oxalic acid. Oxalic acid crystals may clog the kidney and bile ducts. For this same reason, small children and infants should also not overeat spinach. Boil it for about 5-10 minutes. It is is a type of vegetable that can be prepared year round. Young spring spinach does not take long to cook. Just throw it into boiling water long enough to just to "wilt". 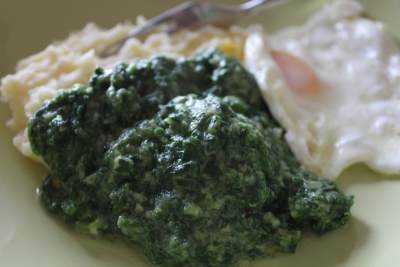 Sour cream and garlic go perfectly with spinach. Mix it with garlic, olive oil, and slices of hard boiled eggs, and you've got yourself a fresh, spring, low calorie meal. Mediterranean spinach salads often include marinated sardines or anchovies, smoked or cold tuna, or mussels. Remove spinach stems and wash it thoroughly. Pour boiling water over it. Drain well and place in a deep bowl. Stir the chopped cheese into hot spinach. Season with olive oil and salt. Make the dough first. Bring milk to a boil, then add butter and salt. When the butter melts, remove from the heat. Slowly add flour by constantly stirring. When it cools, add five egg yolks and spinach, stirring it constantly. Whip five egg whites to stiff peaks and add them to the mixture. Slowly mix it together and pour into a baking pan, greased and sprinkled with flour. Bake on 200° C/400° F until golden. When it is done, turn it over onto a wet cotton cloth. Mix the cream cheese with sour cream and mayonnaise. Leave a small part of this mixture for coating, and the rest mix with ham. Fill the dough with the mixture, and roll it up. When it is done, brush it with the rest of the cheese mixture, and sprinkle with grated cheese. 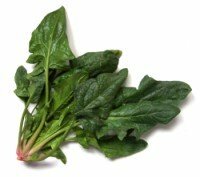 Remove spinach stems and wash it thoroughly. Boil it a few minutes in salted water and drain it well. Grind it in a grinder, or cut into small pieces. Heat butter in a medium sized pan until it melts. Add the spinach and stir well, until the spinach becomes dry. Remove from the heat and let cool. After it cools, add one egg, parmesan, nutmeg, and salt to taste. Mix well. Make walnut-sized balls, roll them in flour, then in beaten egg, and finally in breadcrumbs. Fry in deep olive oil, then discard on the paper towel. Clean the spinach from stems, wash it and cut into wide strips. Add egg, cottage cheese, sour cream, olive oil, and salt to taste. Mix thoroughly. Prepare the dough. If you want to make the dough yourself, here is the recipe. Otherwise, you can use the premade phyllo dough. Put the spinach mixture with a spoon at one end of the dough and roll. Place in a greased pan and bake for about twenty minutes at 200° C/400° F.
Clean the spinach from stems, wash it, and boil for a few minutes in hot water, to which you have added one teaspoon salt. Drain it well and blend in a blender, or finely chop with a knife. Set aside. Put olive oil in a frying pan, add garlic and flour and heat, constantly stirring for one minute. Add water and spinach. Salt and pepper to taste. After it boils, add milk and a beaten egg. Cook for five more minutes and remove from the stove. Serve with mashed potatoes and poached eggs, or with a beefsteak.